These drives are microprocessor based making them great candidates for OEMs who need something custom, whether it be in speed control, torque control, positioning control, or even cycling. These drives have calibration capabilities of Motor Current Limit, Regen Current Limit, Accel, Decel, IR Comp, Min Speed, Forward Max Speed, and Reverse Max Speed. With the microprocessor on board, these trim pot settings can even be set in the drive, removing the trim pots completely and giving a manufacturer the peace-of-mind that it cannot be tampered with in the field. The DC6-12/24-4Q and the DC20-12/24-4Q share the same footprint and size as the HTL1.5-D-4Q, meaning manufacturers who use a range of power supply and motor sizes have the versatility of three different drives without having to change their system. 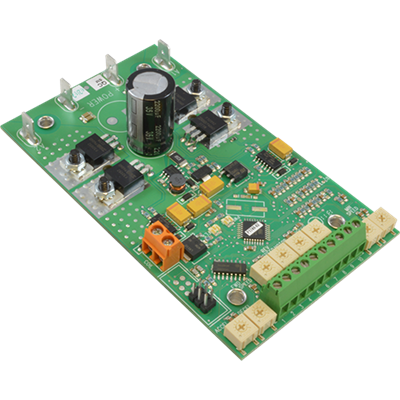 The DC6 even has some of the same features as the HTL, including the ability to follow a 0-5 or 0-10 VDC signal and the ability to bidirectionally control a motor with a unidirectional signal. Speed range, regulation, & form factor: 1% of base speed regulation with 80:1 speed range and a 1.01 form factor over the entire range. Diagnostic LEDs: Power, current limit, over voltage, under voltage, and overheat foldback allows quick turnaround for custom units. Microprocessor based: Allows for special calibration ranges or custom I/O for OEMs. DC6-12/24-4Q allows for unidirectional or bidirectional; control with the unidirectional signal. Ask about custom programming for positioning cycling, Deceleration, IR Comp. RoHS: All DC6-4Q and DC20-4Q series models are RoHS compliant.